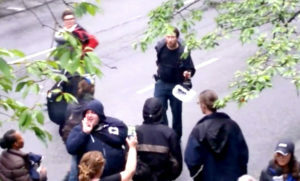 On May 26th Jeremy Christian is alleged to have begun berating two Muslim women on Portland light rail train when three men intervened on their behalf. Police say that Ricky Best, Taliesin Namkai Meche and Micah Fletcher all were attacked when the leftist loon pulled a knife and started slashing the men. When it was over, Best and Namkai Meche were dead. Now we’re getting a look at the charging documents involved in the case and what it tells us about Portland’s prosecutorial priorities. Christian is jailed without bail on two murder counts, but it’s the attempted murder count that’s significant for this comparison. Christian’s alleged attack on Micah Fletcher netted the Bernie Sanders/Jill Stein lover bail of $250,000 for attempted murder. 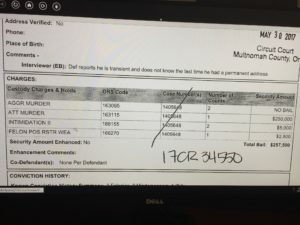 Taking a look at Michael Strickland’s charging documents, when the prosecutor trumped up the two misdemeanors into eleven misdemeanors and ten felonies, we see that his bail was increased to $250,000. After being assaulted and then unholstering his weapon in self-defense and backing off a team of thugs who conspired to ‘throw him out’ of the Black Lives Matter/Don’t Shoot PDX, Strickland received the same bail as an attempted murderer. Prosecutors took Christian’s lengthy police record, including robbery, kidnapping and multiple trips to the slammer, into consideration for bail setting. Strickland? No police record. Same bail as an attempted murderer. This is just another brick in the wall that tells the story of what happens when prosecutors and judges appear to set bail for political reasons rather than legal ones. As I’ve pointed out before, the judge in this case has a daughter who is a regular leftist protester. 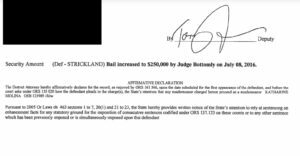 It’s not known if she was at the event last July, but it’s possible personal bias by the judge was brought to bear in Strickland’s case in bail setting. By increasing the charges and throwing everything against the wall legally speaking, his conviction now makes him a felon and unable to own a gun. It goes without saying that Strickland didn’t even come close to attempting to murder anyone. His finger was never on the trigger, but his actions did, however, stop the advance of the same thugs who had just moments before roughed him up, beat him with sticks, and who, after the judge was done with the charges, magically became ‘victims’ in the case against Strickland.